TOKYO, Japan, March 28, 2013 (ENS) – The Japanese utility that supplies electricity to seven prefectures on Japan’s main island of Honshu today officially withdrew its plan to build a new nuclear power plant near the site of the 2011 Fukushima nuclear disaster. Tohoku Electric Power Company said Thursday that it will cancel the construction of the Namie-Odaka plant in view of strong local opposition. Announced in 1968, the plant was to be built about 10 kilometers (six miles) north of the damaged Fukushima Daiichi plant belonging to Tokyo Electric Power Company. At Fukushima Daiichi, hydrogen explosions and nuclear fuel meltdowns followed the March 11, 2011 earthquake and tsunami that shut down power to the water pumps that cooled the nuclear fuel rods. Tohoku already has two nuclear power stations – one in Miyagi Prefecture and the other in Aomori Prefecture. But they remain shut down after the Fukushima disaster as do all Japan’s other 50+ nuclear power plants, except for two near Osaka. All the world’s nuclear power plants generate electricity by splitting atoms in a process known as nuclear fission. But now, Japan is taking a leading role in developing production of electricity by means of nuclear fusion, the process that powers stars and the Sun. In this nuclear reaction, atomic nuclei collide at very high speed and join to form a new type of atomic nucleus, emitting vast amounts of heat and energy. Scientists have been working to harness nuclear fusion as a next-generation energy source. This week, Japanese and European scientists began assembling an advanced nuclear fusion testing facility northeast of Tokyo in Naka, Ibaraki Prefecture. 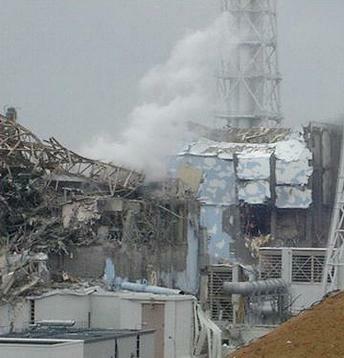 The site is on Japan’s Pacific coast 143 kilometers (89 miles) south of Fukushima Daiichi. About 100 people from Europe and Japan attended a ceremony Monday at Japan Atomic Energy Agency’s Naka Fusion Institute to mark the start of assembling the testing facility. The new fusion testing facility replaces the JT-60 Upgrade experiment recently operating there, using the buildings and basic site infrastructure. 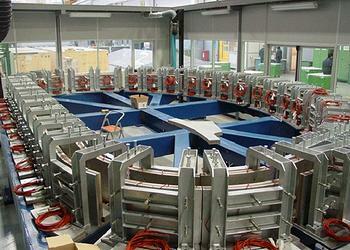 The super-conductivity base for the JT-60SA testing facility was shipped from Europe. SA stands for Super, Advanced, since the experiment will have superconducting coils and study advanced modes of plasma operation. Some 500 Japanese and European researchers are expected to take part in nuclear fusion experiments there. 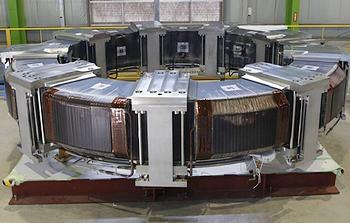 The experiments at Naka will support and optimize the International Thermonuclear Experimental Reactor, ITER, an international nuclear fusion research and engineering project, currently building the world’s largest experimental tokamak nuclear fusion reactor at the Cadarache facility in France. Michel Claessens, PhD, head of communication and external relations for ITER’s Office of the Director-General, told ENS that the new testing facility will also support the fusion power plants that are built after ITER. ITER’s aim is to show that nuclear fusion could be used to generate electrical power, and to gain the necessary data to design and operate the first electricity-producing plant. JT-60SA is an experimental device based on the tokamak concept, in which a hot gas is confined in a torus-shaped vessel using a magnetic field. The gas will be heated to over 100 million degrees, typically for 100 seconds every hour. The plasma fuel will be hydrogen or deuterium. Deuterium mimics the behavior of a reacting deuterium-tritium plasma in a real power reactor or ITER, without generating large amounts of heat or neutrons. The reaction produces some neutrons directly, plus reactions with tritium, a by-product of one branch of the reaction. JT-60SA thus slowly can become radioactive in use, and remote handling of systems near the plasma must be planned. Japan’s JT-60SA nuclear fusion testing facility is scheduled for completion in 2018.